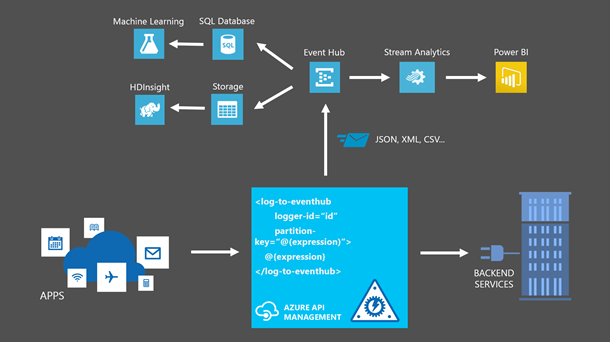 We are excited to announce the new Azure Event Hubs integration features of API Management. Azure API Management provides a turn-key, cloud-based solution that helps API publishers create consistent modern API facades for existing backend services, protect APIs from misuse and overuse, productize the APIs, on-board developers, and gain insight into API usage and health. These challenges are common for all API providers, and Azure API Management handles these management and operational challenges and lets you focus on building APIs and deriving value from them. API Management provides a number of analytics reports out-of-the-box, but for deeper customized analysis, monitoring, or troubleshooting, you can now configure your API Management service to log data in the form of events to Azure Event Hubs. Azure Event Hubs is a highly scalable data ingress service that can ingest millions of events per second. These events can then be consumed by Azure Stream analytics, or by any number of custom consumers. Using API Management and Event Hubs you can easily enable scenarios such as the following examples. API Management and Event Hubs integration is enabled by two new API Management artifacts: the Logger entity and the Log to Event Hub policy. To log API Management events to an event hub, simply link your API Management service to the event hub using the Logger entity, then log the desired events using the Log to Event Hub policy. By using policy expressions and the context variable, you can log rich, context aware event data to your event hub. To get started, follow the step-by-step guidance from the How to log events to Azure Event Hubs in Azure API Management article. Watch the Integrate Azure API Management with Event Hubs companion video walkthrough. For a more complex scenario, see Monitor your APIs with Azure API Management, Event Hubs and Runscope.